It is important that you fertilize your lawn and landscape plants before the end of May with a controlled release fertilizer. June ushers in the new Pinellas County Fertilizer Ordinance which prohibits the use of any Nitrogen and/or Phosphorus containing fertilizers on our landscapes from June 1 to September 30 of each year. Established lawns and landscape plants should survive without additional fertilizer during this time. The best practice is to apply the proper amount of a good slow release fertilizer in late May, then again the beginning of October. Fertilizer companies will be formulating ‘summer blend’ fertilizers that will contain other essential macro and micro nutrients that can be used. In addition, to green up your lawn without Nitrogen fertilizer in mid-summer, you can spray with Iron Sulfate or Chelated Iron. There is one unexpected advantage of not fertilizing during the hottest and wettest months; you might have fewer Chinch bug problems. Research has shown that highly fertilized St. Augustine grass is much more likely to experience Chinch bug infestations. Once the reliable rains start in June it will be a good time to transplant palms and other landscape plants or replace plants that did not survive the harsh winter. Unfortunately, there are not many colorful blooming shrubs like Crotons, Ixora and Alamanda that are fully cold hardy that will also withstand our hot, humid summers. But, here are some shrubs for our area that are cold tolerant. Dwarf Walter’s Viburnum (Viburnum obovatum) 'Ms. Schiller's Delight' is a compact, white flowering shrub-form of the native tree form Walter’s Viburnum. This cultivar need little pruning to keep it at 3 – 4 feet tall. It is great for foundation plant and it produces white flowers from spring through fall. Simpson’s Stopper (Myrcianthes fragrans) is a large shrub or small tree. 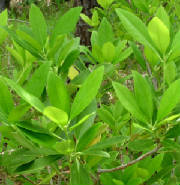 The tiny, deep green leaves have the fragrance of nutmeg. This plant is dense when in full sun, but in shade the foliage becomes less dense, and the trunk displays attractive exfoliating bark. This plant has fragrant, white flowers that develop into attractive red berries that are favored by birds. The ‘Compacta' cultivar is a dwarf variety of Simpson’s Stopper. Azaleas (Rhododendron spp.) ‘Southern Indian’ hybrids have large flowers (2-3 1/2 inches) and open in early spring. These hybrids grow rapidly and may reach a height and spread of 10 feet. They should be planted in partial shade as they suffer from lace bug infestations in full sun. Plant them shallow and use a fertilizer for acid-loving plants. They should be pruned right after blooming to avoid disturbing next year’s flower buds. Loropetalum (Loropetalum chinense var. rubrum) is an evergreen shrub with small burgundy leaves and hot pink flowers resembling small clusters of ribbons in spring and sporadically throughout the year. Do not be misled when you see small loropetalums of any variety at nursery centers. These fast growers do not stay small for long so they’re not plants to be placed under windows. The cultivar ‘Ruby’ is more compact growing about 3-5 feet tall. Like Azaleas, use a fertilizer for acid-loving plants. Florida Yellow Anise (Illicium parviflorum) is a large, evergreen, Florida native shrub with medium -textured, olive green, leathery leaves and small, greenish-yellow flowers. It thrives in part to full sun. The slightly fragrant spring flowers are followed by brown, star-shaped, pods which cling to the stems. The leaves of Anise smell like licorice when bruised or crushed. 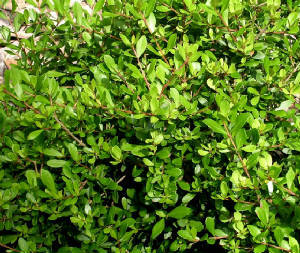 If you are looking for new and interesting shrubs, one of these could be a good addition to your landscape. Remember to calibrate your irrigation system to apply ¾ inch of water each time you water for healthy deep roots on your grass. In addition, always mow your grass at the proper height for your grass type. Our most common type of grass, Floritam St. Augustine, should be mowed at 3 ½ to 4 inches high. Proper mowing height also contributes to a deep root system. It is now too hot to apply any type of herbicide for weed control to lawn grasses without damaging the grass.